Today the Orthodox Church celebrates the Nativity of St. John the Baptist, the Forerunner. He is called “Forerunner” because he appeared before Jesus Christ, to prepare the way of the Lord, in the spirit of what Isaiah had spoken: A voice cries: “In the wilderness prepare the way of the Lord, Make straight in the desert a highway for our God.” He was a voice crying out in the wilderness of human society, preparing a people’s hearts to receive the coming of the Lord. Two thousand years later, I venture to say that hearts are still not prepared for the coming of the Lord; the way still needs preparing. The world is still a desert, a “highway” for God is nowhere to be found. There are churches, cathedrals and monasteries all over the world that claim to have his belt or some other garment of his, some piece of his body or even his head! But nowhere is his spirit to be found. John was a rebel even before his birth. The story of his conception and birth is told in the first chapter of Luke. He was conceived by divine intervention in a manner similar to the birth of Samuel a thousand years earlier. After the birth of Samuel, his mother Hannah prayed a most remarkable prayer, a prayer far from what we might think would be normal after the birth of a child. But these were revolutionary times. Both Hannah and Mary spoke of justice – justice for the poor and hungry, justice that would overturn the high position of the rich and powerful. God’s values were always the opposite of man’s values, regardless of whether you are speaking of ancient Israel or the Roman Empire of Jesus’ time… or today. John’s appearance was offensive to civil society. He told people to repent, for the kingdom of God is at hand – not the kingdom of man, not the kingdom of Rome, not the kingdom of the IMF or any other worldly power then or now. The Church calls him a saint – but by doing so, have we managed to lose the bite of his existence? Have we domesticated this wild man who lost his head to a king? Did the kingdom of God prove powerless after all, to save him? And did the kingdom of God fail to save John’s cousin, the Lord Jesus Christ, whose way John prepared? Ah, but the story is not over. The kingdom of God is still coming, the way is still being prepared – if not by John, then by those who choose to go against every institutional restriction, who refuse to be brainwashed by the mighty who still sit on their thrones. Christianity has always lived among those who prefer the wild ways of John, not among the comfortable. If your Christian faith makes you comfortable, you really need to go back and open the Gospels, especially Mark, Luke and Matthew. John walked in the spirit of Elijah. 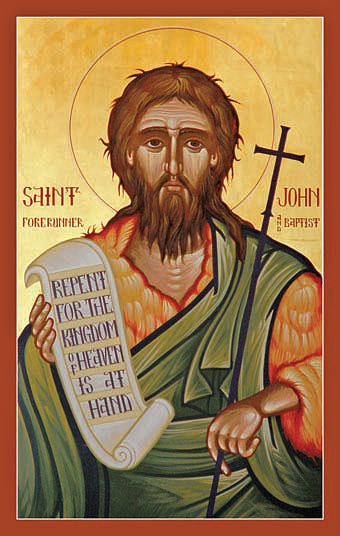 We are called to walk in the spirit of John, to prepare a way for the Lord, to make a highway for him in the desert of the world’s spiritual emptiness. We are also called to speak with Mary, to dream with her. We sing the words that Mary spoke at every Matins service in the Orthodox Church. We sing them. Perhaps we need to speak them instead – speak them to each other and to the powerful who think they own the world and all that is in it. Categories: Radical Christian Thoughts | Tags: Hannah, John the Baptist, Magnificat, Mary of Nazareth, Samuel | Permalink. I hope the lovely and talented Christine Lagarde of the IMF is reading this, for no matter how clever, urbane and well-informed you may be, you are bound for the bad place if you neglect the least important of your brothers and sisters. Sister Christine, if you don’t want to sizzle, pay attention to the needs of the poor in Greece. As for the reasonably rich in Greece that never paid their taxes, that divine BBQ, it’s for you, unless you change your ways. The well-dressed and coiffured Christine Lagarde has become for me the face of neoliberalism and the callous indifference of the capitalist elites to the suffering of peoples. Greece and Greeks are certainly not exempt from responsibility for their economic woes – but are Greeks the only ones who have made mistakes and who have bought into the market ideology to buy, buy, buy? What about the banks and Wall Street entities? Why were they bailed out? Why can’t the Greeks be forgiven at least part of their guilt? And is it ethical for the Euro powers and the IMF to engineer a regime change in Greece? Because I’m convinced that’s what they’re aiming to do: bring down the Tsipras government in one way or other. What I’m afraid is that the Greek people will prove too cowardly to say No to Europe. They want relief from austerity but want to stay in the eurozone. I don’t think they can have it both ways. I hope they vote No to the troika and to Europe. Bring an end to the illusion! Greece IS Europe, but not the Europe of today. Greece is where Europe began, but Greece does not belong in the Europe of today. Let the Europeans roll in their imaginary wealth. Greeks can go back to being a happy, independent people, free of German bosses.